WATCH JANET PFEIFFER ON THE NEWS! 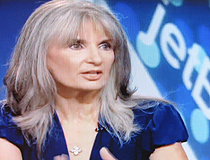 Listen to Janet on Fox News Radio: The Death of Innocence - What lies behind recent school massacres. 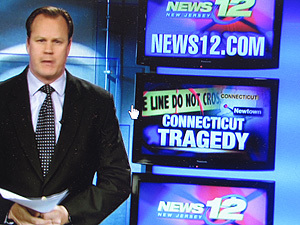 News 12 NJ - Janet Pfeiffer speaks on the school shooting in Newtown, CT. Accountability and Revenge - Is it ever okay to get even? 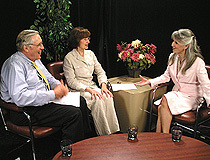 Janet Pfeiffer of Pfeiffer Power Seminars discusses accountability and revenge. 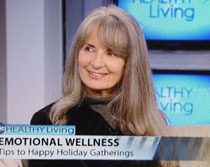 Treating Depression - Janet talks about healing depression naturally. Resolving Disputes - Janet Pfeiffer discusses how to resolve disuputes with difficult neighbors and family. Cyber Nastiness - Janet dicusses cyber nastiness with Ebru host, Bryan Jenkins. Drive to Stay Alive - Janet talks about road rage and aggressive driving. Bullying - Janet Pfeiffer discusses bullying. 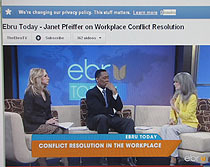 Janet Pfeiffer with hosts Bryan Jenkins and Lucy Segal discussing causes of conflict in the workplace. "How to Avoid Family Holiday Drama Without Actually Avoiding Family"
Enter 'Janet Pfeiffer' into Search. Then click to hear On-Demand Podcast.